Up until last week I had never tried Fiber One Cereal. To be totally honest, I was more than just a little nervous to try it. Would it taste good or would it taste like cardboard? We eat a lot of cereal in this house but we tend to stick to our usual favorites. Why fix something that's not broken. Right? I had placed five boxes of Fiber One Cereal on the kitchen counter and simply hadn't gotten around to putting them away. My kids were hungry for breakfast and went into the kitchen to get their morning cereal. I was surprised when I walked into the dining room and they were each eating a bowl of Fiber One. My 10 year old son was eating a bowl of Fiber One Shredded Wheat and my 7 year old daughter was eating a bowl of Fiber One Caramel Delight. I asked them if they liked the cereal and they both said loudly... "YES!" Then my son said, "This is the best cereal I've ever had!" My daughter quickly followed with, "It sure is!" Two of their favorite breakfast cereals are Frosted Mini Wheats and Cinnamon Toast Crunch. Guess what the two Fiber One Cereals they chose look like? Yep, you guessed it... their favorite cereals. They had no idea they were eating something other than their favorites and that is was healthier for them. I'm going to have to agree with my kids and say that Fiber One Cereal is delicious! If I had known they were going to taste this good I would have started eating it a long time ago. They will definitely be on my shopping list from now on. Nine out of 10 Americans aren´t getting enough fiber - an alarming statistic, considering how important fiber is for overall health. The 2010 Dietary Guidelines for Americans say people should consume 25-38 grams of fiber daily, and that the average American consumes only 15 grams. What´s amazing is that incorporating fiber into your diet can be effortless and definitely delicious, with Fiber One cereals offering at least 30 percent of the Daily Value per serving. (Some Fiber One cereals offer more than 50 percent!) 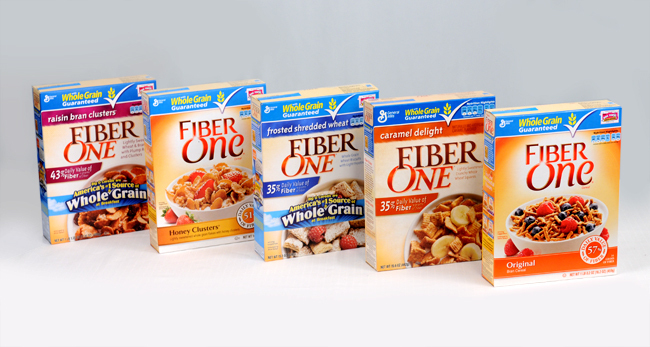 Fiber One Original® and flavored varieties like Honey Clusters®, Raisin Bran Clusters®, Caramel Delight®, and Shredded Wheat®, make fiber taste good and help to give people a jumpstart on their fiber intake each day. A recent nutrition review* concludes that eating fiber is associated with reduced risks of cardiovascular disease, obesity and diabetes. In addition, fiber helps you feel satisfied, which makes it easier to stick to your diet and lose weight without feeling as hungry. Tell me how you incorporate fiber into your daily diet. **I received one or more of the products mentioned above for free. General Mills provided me with the free product, information, and gift pack through MyBlogSpark. Regardless, I only recommend products or services I use personally and believe will be good for my readers. The views and opinions expressed on this blog are purely my own. Results may vary. I was not compensated in any other way for this review. The generous sponsor of this giveaway will mail the prize directly to the winner. A special thanks to General Mills and MyBlogSpark for this great review and giveaway opportunity! We start out eating a high fiber cereal or bread for health reason. We try to eat only whole wheat bread to give us extra fiber. I try to eat atleast one fresh fruit a day. I eat High Fiber cereals and I add Flax seed to increase my daily fiber. Mandatory - I actually already incorporate it into breakfast-- I have the fiber one pancake mix! I would love to have cereal, too! thanks for the great giveaway! we incorporate fiber into our diets by eating lots of fresh fruits and veggies, using whole wheat flour when i bake, and staying away from most processed foods! High fiber cereal when possible as well as using a lot of whole grains. I just pulled out a loaf of fresh homemade whole wheat bread from the oven!